“Gift Box” photo by Daniel Y. Go. Used under a Creative Commons license. When it comes to selecting great gifts for kids, it’s important to gift experiences, not just toys. After all, studies show that experiences make people happier than objects do: Objects break, become outdated, or pale in comparison to superior items, and the thrill of ownership fades quickly. But experiences are personal, and the memories of positive personal experiences never lose their lustre. If you still have Father’s Day shopping to do, applying this principle to dad’s gift could prove very satisfying. If the gift is an experience that father and child can share together, the whole family can benefit. 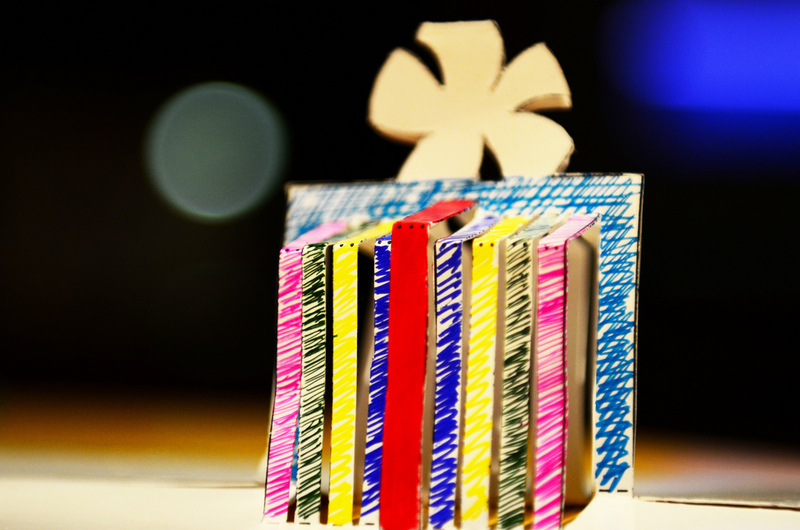 The key to making sure the experience is a good gift is keeping the recipient’s interests in mind while doing so. For example, if the father is a sports fan, a child might give his or her father tickets to a sports game–and promise to go with him. Plans for a father-child outing could also work with tickets to a concert, a museum, an art exhibit, or another destination that suits the father’s interests and the child’s age. Gifts meant to be experienced together at home can make a great choice, as well. For example, tools are a perennially popular Father’s Day gift. Consider supplies for a project that the father and child can create together–gardening or carpentry or technology oriented. (For techie dads, the books in the Geek Dad series are full of amazing ideas.) The project could be as small as a birdhouse or much more complicated, depending on dad’s skills and the child’s age. Another possibility: Seek out a toy that’s meant for both adults and children, around which family memories can be created. For example, toys like Geomags are fun for adults and kids alike–and they can be used collaboratively. The strategy game Rush Hour is also fun for all ages. If dad likes strategy games or puzzles, it could be a nice choice. Sometimes, it can be difficult for dads and daughters to develop shared interests. All of the gifts above could be given by boys or girls–but some girls and dads might hesitate when it comes to sharing experiences like carpentry, which are traditionally coded as masculine. An experience-oriented gift that helps a daughter learn more about her dad’s interests and hobbies, despite gender stereotypes that they’re “not for girls,” is another way to give a gift that benefits the whole family. Diversifying the daughter’s interests with dad’s support could benefit her in the long run: Studies show that when fathers support their daughters by engaging with them in non-stereotypical ways, the daughters are significantly more likely to consider studying and working in STEM fields, which many find satisfying and lucrative. Is your daughter unsure about joining her dad in his hobbies? The children’s book Super Tool Lula may offer her some great inspiration. The book’s heroine, Lula, enjoys helping her father with carpentry projects using tools from her very own tool belt–and after reading the book, girls often ask for their own tool belts. Taking a page from Lula‘s book, daddy-daughter tools might make a great, creative Father’s Day gift. No matter what route is taken when helping a child give a parent a gift, the results of other studies bear mentioning: spending money on others makes us happier than does spending money on ourselves. So, if it’s possible for a child to willingly contribute some of his or her own money towards dad’s Father’s Day gift–whatever that gift may be–he or she will learn that giving to others really is its own reward. Readers: What are the best experience-related gifts you’ve given or received? Do you have any clever ideas for Father’s Day gifts? Please share your ideas in the comments! Enjoy this blog? Find me on twitter or facebook. Great ideas here. My daughter and geek husband love playing Disney Infinity together, particularly the Star Wars story sets. We’re getting him the Guardians of the Galaxy pack for this Father’s Day and they can play that together too!